EDMONTON – Concordia University College of Alberta (CUCA) is introducing a new look as part of its Concordia Tomorrow initiative. Over the summer, the university college upgraded its facilities and renewed its image as part of the federal government’s Knowledge Infrastructure Program (KIP). Recent construction projects included work on the library; repair of the heating and cooling systems; and a renovation of the auditorium, the first in thirty years, as well as other projects around the campus. The school’s visual identity also received a makeover with the introduction of a new logo which the administration hopes will more accurately represent the institution’s character and goals. The logo, designed by The Met Agency, officially replaces the current visual identity on January 1, 2011. It features the wordmark “Concordia” on the top line with “University College of Alberta” underneath to convey its identity more clearly and avoid confusion with institutions using similar names. The rest of the logo features an open door, based on the front door shape of the oldest building on campus, symbolizing access to education at Concordia, as well as a reference to the Wittenberg door where Luther nailed his 95 theses. Wavy lines represent the North Saskatchewan River above which the campus is located in Edmonton’s Highlands neighbourhood. The word ‘Concordia’ contains a Greek cross symbolizing both the theological foundation of education at CUCA and the two main elements of faith: a vertical relationship with God and a horizontal relationship with other people. The institution will continue using the old crest on official documents, and while the old logo will be slowly replaced as needed, the new logo is already available for faculty and staff. As Concordia University College of Alberta, grows and changes, its new visual identity will help reflect both its history and its character. 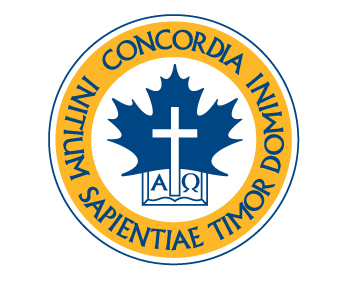 Concordia University College of Alberta was established by Lutheran Church–Canada in 1921 as Concordia College. A liberal arts institution, it offers undergraduate degree, post-degree, and post-graduate degree programs in arts and sciences including religious studies. CUCA also prepares pre-ministerial students and deacons (Lutheran teachers, directors of Parish Services and Parish Nurses) for service in the church.